The project is not related to FPL’s proposed $1.5 billion, 300-mile natural gas pipeline that would have run from Bradford County to Martin County. The Florida Public Service Commission rejected that project in 2009. “PETITION APPENDIX “A”, MAP OF: ALL EXISTING, APPROVED & PROPOSED NATURAL GAS TRANSMISSION PIPELINES & PROPOSED CORRIDOR OF THE FLORIDA ENERGYSECURE LINE,” “IN RE: FLORIDA POWER & LIGHT COMPANY’S PETITION TO DETERMINE NEED FOR FLORIDA ENERGYSECURE LINE,” FL-PSC Docket 2009072, 7 April 2009, Florida Public Service Commission. This 32-mile (or 38-mile) 24-inch (or 20-inch or 18-inch) steel pipeline was build by Diamond K. Corp. and Troy Construction, “both based in Texas”. Troy may sound familiar as one of the contractors for Sabal Trail. This FPL pipeline to the sea is hard to track, because it has gone under many different names: RBEC Lateral, Riviera Lateral, or Martin-Riviera Natural Gas Pipeline Lateral and related equipment (“MR-RV Lateral”). 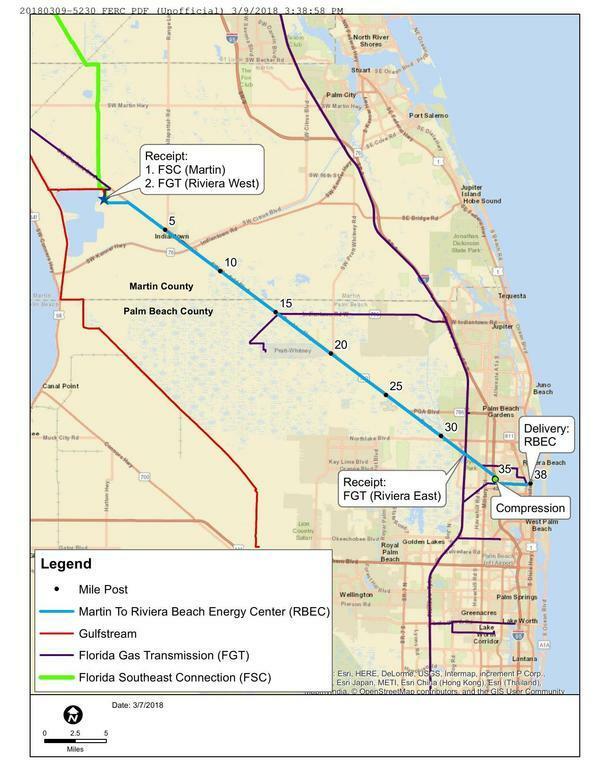 Under that last name, in March and June 2018 FPL asked FERC and FPSC to roll it into Florida Southeast Connection (FSC). Nevermind that FPL redacted what FSC would charge and future cost projections, so the rate-paying and tax-paying public doesn’t know what they’re in for. 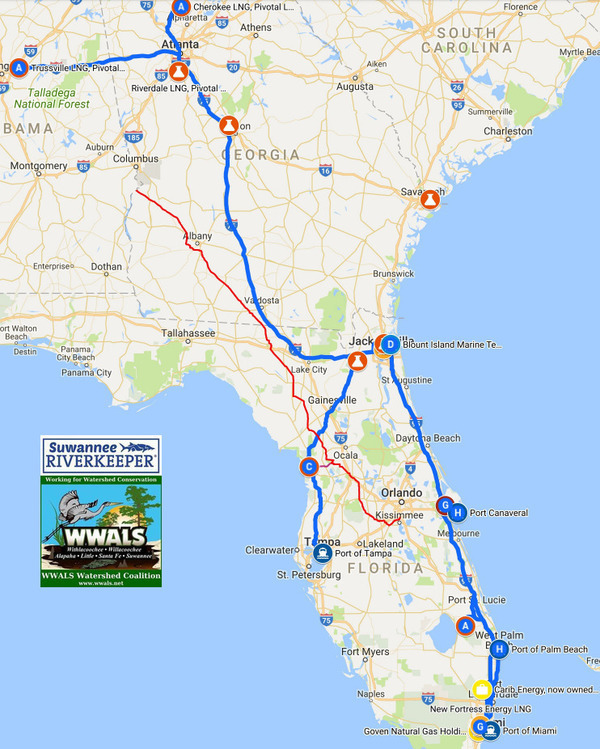 Nevermind that MR-RV was not permitted along with FSC, Sabal Trail, and the Hillabee Expansion Projet in the Southeast Market Pipelines Project (SMPP). Despite all the different names and lack of FERC environmental or other assessment, on 6 August 2018, FERC approved rolling the Riviera Lateral into FSC, and on 10 September 2018 FSC informed FERC that combined service had commenced 1 September 2018. 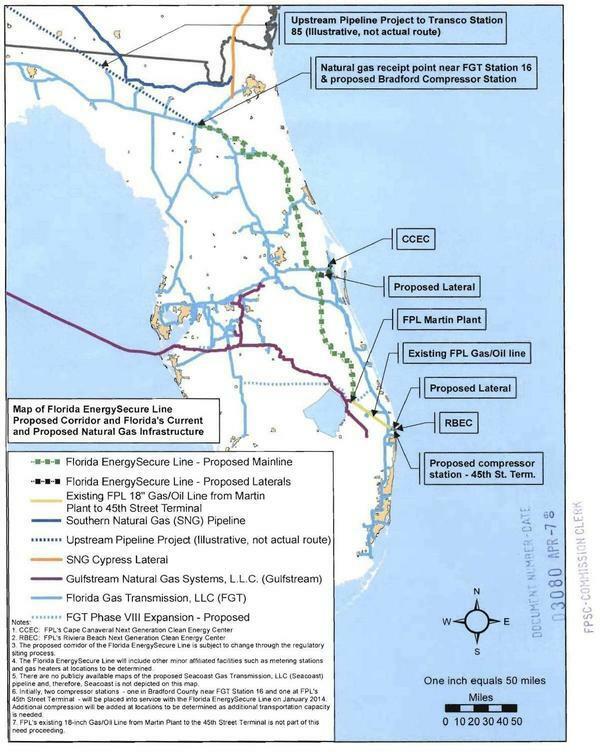 It’s pretty clear this FPL pipeline to the sea was planned since 2009 or before, and just happened not to be included in SMPP, getting rolled in later. Carib indicates that exports may occur from the ports of Jacksonville, West Palm, Miami, Pensacola, and Tampa, Florida; Mobile, Alabama; Gulfport, Mississippi; Savannah, Georgia; New Orleans, Louisiana; and Houston and Galveston, Texas. DOE/FE Order No. 3487, Carib Energy (USA) LLC, FE Docket No. 11-141-LNG, FINAL ORDER GRANTING LONG-TERM MULTI-CONTRACT AUTHORIZATION TO EXPORT LIQUEFIED NATURAL GAS IN ISO CONTAINERS BY VESSEL TO NON-FREE TRADE AGREEMENT NATIONS IN CENTRAL AMERICA, SOUTH AMERICA, OR THE CARIBBEAN, 10 September 2014. Port of Palm Beach is about 300 feet from the nominal destination of the MR-RV Lateral, FPL’s “Palm Beach Plant”, aka the Riviera Beach Next Generation Clean Energy Center. So this is yet another example of how the pipeline companies are in cahoots over many years and many locations, and the pipeline permitting process is a sham. Maybe you’d like to help support the WWALS pending lawsuit about LNG export. Help stop FERC shirking its LNG oversight duty. What a bunch of coincidences! And Gerdau Steel just happened to decide that Indiantown FL was the perfect place to set up shop.